"Whoever builds a bridge or a building owes an obligation to the community that it shall embellish and not deface the locality." -Cass Gilbert,(1859-1934) Architect for the Minnesota State Capitol Building, The United State's Supreme Court Building and other notable structures. As President of The Commers Company, Joseph E. Commers provides real estate investments and development services to individuals and national companies. 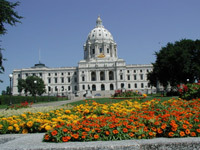 He is a registered real estate broker licensed in the State of Minnesota. He believes in real estate acquisitions that are understandable, rational and have both short and long term potential. "I will use 'price and intrinsic value' and a 'margin of safety' as key determining factors in growing, nurturing and investing in my business." I will strive to be a passionate man of strong character defined by wise judgment, industrious actions, and integrity. My work will be chosen and enriched based on my passion and enthusiasm.